Explore Historical Williamsburg through Interactive Fiction! What is the Historical Williamsburg Living Narrative? Imagine Interactive Fiction crafted around real places and people in history, where not only can a person read about settings and events, but the person can be a part of the unfolding story as an actual character. 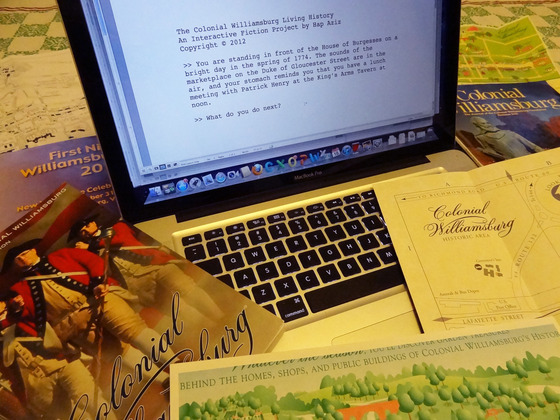 The intent of the Historical Williamsburg Living Narrative project is to build the geography, culture, and characters from the years surrounding the birth of the United States in Williamsburg, Virginia, using the literary format of Interactive Fiction. This three-phase project will include the development of functional maps, the architecture of the historic buildings, and interaction with significant characters such as Patrick Henry and George Washington. Each phase is a project milestone, completion coming 150 days after start. It is a computer game: Individuals will “play” a character out of the historical times around the date of the American Declaration of Independence. They will be able to interact with actual historical figures of the day that lived or visited Williamsburg, Virginia, and they will learn about the events that brought the 13 colonies to sign the Declaration on July 4, 1776. The game environment will be an accurate map environment of Williamsburg as it existed then, and players will be able to roam the streets, enter the buildings, and go anywhere as they encounter people from the past with stories to tell. The game will be in the format of Interactive Fiction, which you can learn more about at the Interactive Fiction Wiki here. It is a history lesson come to life: If you are someone interested in the history of how the United States was formed, the Historical Williamsburg Living Narrative will be one of the best ways to learn it. Like a time machine for the imagination, it will transport people back to the days of Thomas Jefferson, Patrick Henry, and Peyton Randolph, where they can learn about the events of the times by talking with these historical figures. Whether you are a history buff, history teacher, or just a fan of Interactive Fiction and period pieces, this game will have something for you. It is a Kickstarter project: If you’re not familiar with Kickstarter.com, then you should check it out here. Kickstarter is a wonderful way of funding projects, where individuals may donate funds (in small amounts or large, and anything in between) to get a project off the ground. The Historical Williamsburg Living Narrative is a Kickstarter project, and it will be launched officially sometime in April. More details on participation and rewards will be coming, so you can check back here–or better yet, subscribe to this blog for updates on the project. This is an exciting project to launch, and we hope to have your participation and support! And be sure to pass the word to anyone that you think may be interested in bringing the history of Williamsburg, Virginia, to life!